Subscribe to our weekly “Spirit Voyage Radio with Ramdesh” iTunes podcast here! “Today’s show,” says Ramdesh, “is all about rest and relaxation and using mantra from a place of ease.” Taking a spirit voyage and walking the spiritual path doesn’t have to be hard, she points out. Movement and effort are often part of Kundalini yoga kriyas, but things don’t always have to involve struggle. Today’s podcast reveals how mantra can be used in a loving, joyful, relaxing and heart-centered way. So kick off your shoes–and chill! Stress causes illness. Much of it is self-created by our monkey minds, and the stories we tell ourselves. The stress builds and creates toxins in the body. “We can live from the heart, we can be peace,” Ramdesh says. Mantra is a tool we can use to get there. When Ramdesh was putting this show together, she says, she opened herself to the love of the Infinite, and these songs came forth. Surrender and enjoy! 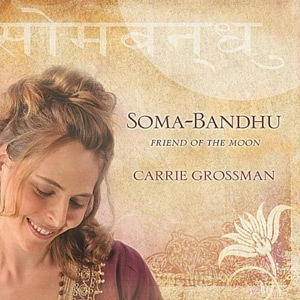 The first song is by Carrie Grossman and is called “Sri Rudram.” This is another early name for Shiva and is from the album Soma-Bandhu: Friend of the Moon. Relax and connect with this beautiful, relaxing piece. You don’t even have to know what the words mean, just release the stress and open your heart, Ramdesh suggests. Next is by Peia, from The Dance of Devotion, called “Shree Krishna.” This is similar story to that of Jesus; Krishna represents total love, joy, and kindness. Krishna has many aspects but his main message is love. Ramdesh shares a poignant story about how you can choose love over stress, negativity, and worry. 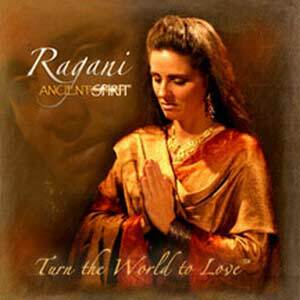 Ragani’s “Prayer of Harmony” from Ancient Spirit is next. This song is a prayer for universal harmony and calls on the Divine to protect us and help us work together and uplift one another. “It’s a call to see all living beings as one together as a family,” Ramdesh explains. Rest as you listen to this harmonious selection. Satyaa & Pari follow with “Shri Ram” from To the One. Ram is God incarnated into the flesh of a man, a familiar story. Ram often forgets he is divine, and he gets an opportunity to awaken to the divinity within him. Can you relate? So many of us have survived the wild and troubled times of youth to awaken to our own soul and divinity, Ramdesh notes. “You can connect with the Divine in English, or any language. The next song is by Tanmayo and it’s called “Nada Te Turbe.” It’s a Spanish song, a sweet, ecstatic poem by Saint Teresa of Avila. This is a song that helps you to trust and let nothing disturb you. “The Divine has your back!” as Ramdesh says. We can surrender our stress, anxiety and physical problems when we recognize that God is the Doer, ever-present, right here, right now. Listen to this delightful Spanish rendition from Dust at Your Feet. 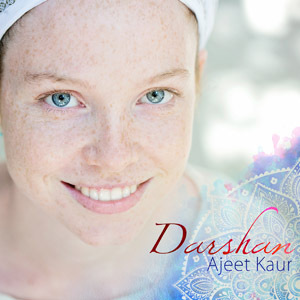 By Ajeet Kaur, you’ll hear “Dance of Ganesha” from Darshan. All of Ajeet’s music has this frequency of ease, Ramdesh notes. Ganesha is the remover of obstacles, so if you have a lot of stress, call upon Ganesha and let your breath come to a place of ease. “Open your heart to the resonance of love,” says Ramdesh. Settle into your heart center and open up to the Divine with this restful podcast. Nourish your soul, let go, and give yourself a needed and well-deserved break! 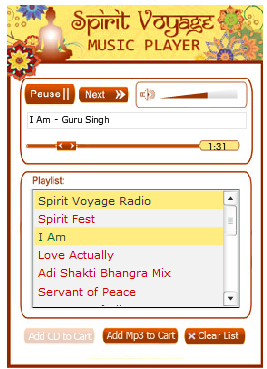 Free Yoga, Mantra and New Age music Radio....Spirit Voyage Radio is HERE!!! 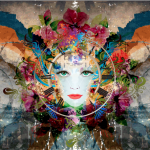 Surprise Spirit Fest Guests on Spirit Voyage Radio with Ramdesh!